I know that I’ve been doing a lot of ice cream posts lately, but with the temperatures getting to over 100F on a regular basis here over the last month, it’s hard not to want a lot of cold food. Besides, I tend to make small batches of ice creams – not to mention that Sarah’s chosen theme for this month’s Sugar High Friday was cold desserts! So, I’m not going to apologize for not doing a lot of baking lately, but I do promise to back of the ice creams for… at least a day or two. In the meantime, I encourage everyone to buy and ice cream maker. Anyway, I wanted to do something a little bit different. 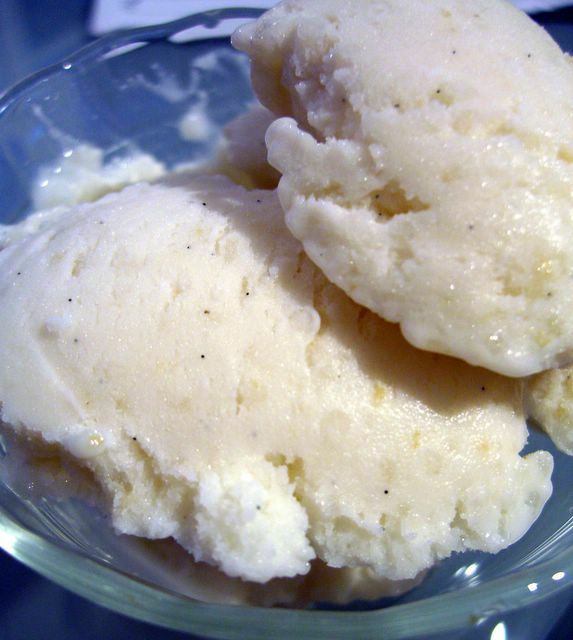 I had heard the idea of rice pudding ice cream mentioned by a few people in passing and, the more I thought about it, the more appealing it sounded. I tried it and I loved it. It’s just as easy as making rice pudding, chilling it and dumping it into an ice cream maker. This means that you could actually buy some rice pudding and do the same thing, if you don’t want to make it yourself. I made my favorite rice pudding recipe, which I like because you don’t need pre-cooked rice for it to work. I used milk, instead of cream, because I felt that the starchiness of the arborio/short grained rice that I used would serve to add a thicker, richer texture to the final product. Skim milk or low fat is completely fine for this recipe, and soy milk will work well, too. If you want to make the ice cream richer – by which I mean more fattening – and lighter in texture at the same time, fold 1/2 cup of unsweetened whipped cream into the pudding before putting it into the ice cream maker. The ice cream is very creamy, with some texture and a bit of chew from the rice. Think of it as having sprinkles (uh, very tender sprinkles) mixed into the ice cream – and that texture really sets it apart from plain ice cream and makes for a nice change. I used a lot of vanilla in my pudding, but you can add cinnamon or other flavored extracts, too. This recipe also makes fantastic pudding pops. Combine rice, sugar, water and vanilla bean in a medium sauce pan. Bring mixture to a boil, stirring to dissolve the sugar, then reduce to a simmer until all the liquid has been absorbed, about 45 minutes. Carefully remove vanilla bean. Scrape out the seeds and stir them into the rice. Stir in the milk and, keeping rice over low heat, bring to a simmer. Remove pudding when it begins to bubble, after 20-30 minutes. Transfer pudding to a large bowl and refrigerate at least 4 hours, or overnight. Pour into ice cream maker and freeze according to the manufacturer’s standard directions for regular ice cream. Scrape into a freezer-safe container and freeze for at least 30 minutes until serving.Serves about 6. Note: If you want to stir in some raisins at the end of the churning, feel free. I’m not a huge fan of raisins in ice cream, personally, but they do taste great in rice pudding. Oh, please don’t apologize, I am loving the ice cream posts!!! Hehe! 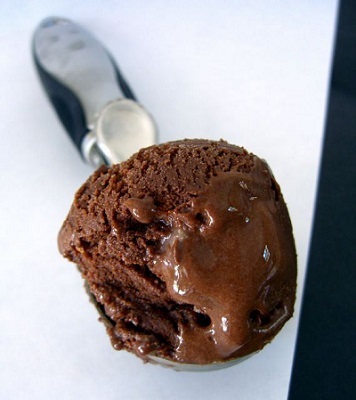 The chocolate gelato looks awesome! Now this one is such an interesting idea. I would never think about freezing rice pudding myself. That is such a cool (ha ha) idea. The pic is lovely, too! Oh man, that sounds so great – am especially loving those tiny vanilla seeds in the ice cream! You’ll love this month’s Gourmet, there is a great article on getting creative with ice cream and gives great tips on judging consistancy when using different mix-ins. Look at their Cinnamon Toast Ice Cream- Yum. Hi, I’ve been reading your blog for a while and was wondering if ice cream could be made without the need of an ice cream machine? Can’t you just chuck the mixture straight into the freezer? In your rice pudding recipe, there was a bread pudding recipe on the bottom. Hmm, could you make bread pudding ice cream? I LOVE bread pudding. We ALL scream for ice cream, then! ;-D Love this idea, did an AMAZING chocolate malt here last night! This would have been great on the side!! No, you need an ice cream maker to do this. If you read through some of my other posts about ice cream, I cannot stress enough that if you want to make ice cream at home, you need to get an ice cream maker. I’ve been visiting your blog for a while but haven’t commented. First – thanks so much. All of your recipes and photos look absolutely delicious! I’ve only tried a couple recipes thus far, but the ones that I have tried have all been winners. I’ve been craving rice pudding for a while, so I decided to try your recipe. I wanted it to have the flavor of kheer so I added the vanilla bean, a couple of cinnamon sticks, and some cardamom in the water. Then, at the end of the freezing I threw in some chopped almonds. I wasn’t sure about it last night when it was a bit soft (the taste was amazing but the texture threw me a bit) but today, after the ice cream had frozen quite hard so that the only way to eat it is to scrape your spoon along the top and eat a little bit at a time, I really, really like it. I don’t know if it’s the new (hard frozen) texture or letting the ice cream sit over night with the flavors melding, but I’ve been stealing spoonfuls of the ice cream all afternoon. So anyways…thanks so much for another amazing recipe! I’ll be sure to check back often to see what other delights you have cooking! hi nic..yr puddin looks so yummy! nice for a sweet friday. Btw how do i take place in the Sugar high friday? It really sound so cool that i am all on for nxt month SHF. drop me a mail. thanks! what? no raisins? Mmmmm… I LOVE rice pudding so I would be a big sucker for this ice cream, I’m sure. I’d bet it would be good with a rhubarb compote. What a great idea! It sounds scrumptious – make mine with lots of cinnamon please! can i sub vanilla extract for the bean? if so, how much is equivalent? Anu – Yes, just stir in 1-2 tsp vanilla extract when you remove the pudding from the heat, before chilling it.